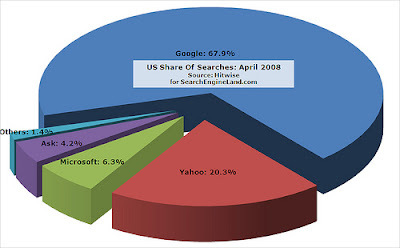 Hitwise released the latest statistics for search engine share in the United States for April 2008. 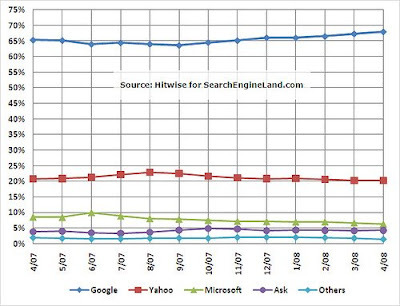 Google has again hit a new high, jumping up 0.65% from the prior month's high, to 68% of the US search market. Microsoft and Yahoo hit all-time lows -- though Yahoo, at least, only drops by 0.1% further from its low last month. Microsoft dropped about 0.4%. Here are the past data of how they had performed over the years. Clearly Google rules the world of search.